AXIS CARE GROUP is a community building organization. It began because I started seeing so many causes in the world that would benefit from the support of my family, friends & people I know. 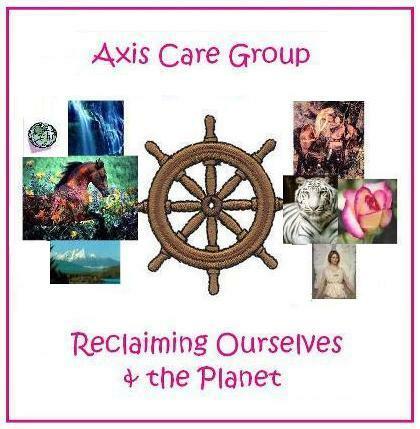 Axis Care Group is a collection of contemporary causes for you to investigate & do what you can at this time to help. Or, feel free to post your favorite causes. We of the Earth, must take care of our own. Let us have one mind to create Peace on Earth, Good Will to All, & watch the flowers grow, the waterfalls gush, the butterflies flitter & flutter, as the song goes… So as you discover what needs attention in your network or community, feel free to build a better world with all the choices you make which have a positive impact. In the spirit of creating Heaven on Planet Earth, we have assembled a range of products and services to help men, women, and children, artists, healers, and the environment in which they live and thrive! To do this, we explored the process of how people come “undone” and how they are put back “together” again, on every level of their experience and full human potential. We discovered first that a safe environment is paramount. This includes the health of the materials and resources around them: sun, soil, air, water, clothing, furnishings, tools, et al. Similarly, the planet’s ecological issues seem to go hand-in-hand with personal healing & transformation, because we need clear thinking people to address the decisions made by a few which affect so many. We have an incredible opportunity to create healthy communities around the world using these wonderful techniques for planetary and personal evolution.